Tickets - Purchase Online: Available Now! We strongly recommend buying tickets online. Why, you ask? 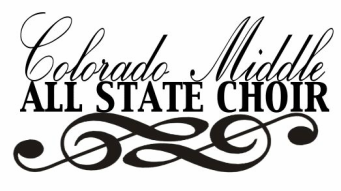 The All-State Middle School Choir Concert is being recorded with state of the art professional digital audio and video equipment. Orders are being accepted now with the order form available above. Please mail or email your pre-orders straight to Hidden Treasures as per the order form. The cost of purchase includes shipping and handling to anywhere in the U.S.
T-shirts are available through pre-order, and will also be sold at the event. Long-sleeved shirts and hoodies are only available by pre-order, which should be sent in with your school's other acceptance documents, no later than December 14th.